Sell a story to the Sunday Star: Evil flatmate poisoned me! Last week, Jamie Price contacted us to help him manage his media attention. He was a victim in a serious crime which made national headlines. Journalists were door knocking Jamie for a sit down interview after the initial story from court made in the papers. Through no fault of his own, Jamie found himself under the media spotlight and wanted advice on what to do next. He called us and explained he was a victim in a case which was picked up nationally, and wanted advice on speaking to the press. 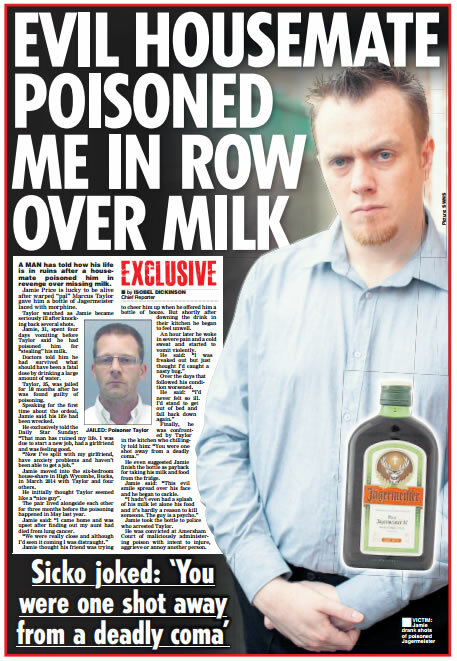 Jamie told us how his former flatmate, Marcus Taylor, 35, had laced a bottle of Jagermeister with a deadly dose of liquid morphine – in revenge for pinching milk from the shared fridge. Jamie, 31, was mourning the death of his beloved aunt and believed Taylor was trying to comfort him. He unwittingly downed the dangerous concoction without knowing its deadly contents, because he thought his flatmate of 12 weeks was trying to cheer him up. But cruel Taylor had poured an unknown amount of the high-strength prescription painkiller – made from the same substance as heroin – into the bottle, which left Jamie dangerously lethargic and close to death. Fortunately, Jamie survived and Taylor was found guilty in Amersham Law Court with one charge of maliciously administering poison with intent to injure, aggrieve or annoy any other person. After a three-day trial, Taylor was banged up for 18 months. After speaking to Jamie, we placed his story exclusively with The Sunday Star – they were one of the papers who had been door knocking Jamie after seeing the initial reporting of the court case. Jamie was delighted with the fee we secured him and through us did a sit down interview. We then read back the copy to him before it went to press to make sure he was 100 per cent happy with it. We are now in the process of securing Jamie a magazine deal. If you’ve had journalists at your door and would like free confidential advice, give us a call on 0207 549 5406 or fill out the form on this page. One of our dedicated team will get back to you ASAP. Please do not contact any other journalists, agencies or publications directly until we’ve replied to you – as this could compromise any deal we secure for you in the future.